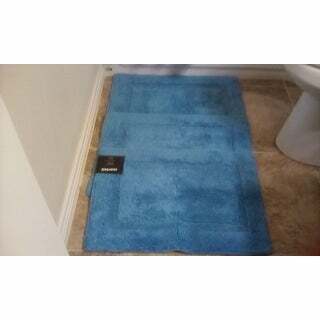 This rug is great for stepping in and out of shower, does not slip. Great colors. Would order this again. Decorate your bathroom with this stylish ringspun bath rug. Made with 100-percent cotton, this rug features a plush tufted texture, making this extremely comfortable to walk on. Available in six different colors, you can be sure to get the right color that best matches your existing bathroom decor. I bought 2 of these for the double sink vanity in our bathroom so each person using the bathroom has a mat to stand on while at the sink instead of standing on the cold floor. They are comfortable to stand on and are made from a "plushy" material. The grip on each mat prevents slipping. A nice, comfortable accent to our bathroom. Nice, soft, cotton bath rug which is just perfect for a small area bathroom. 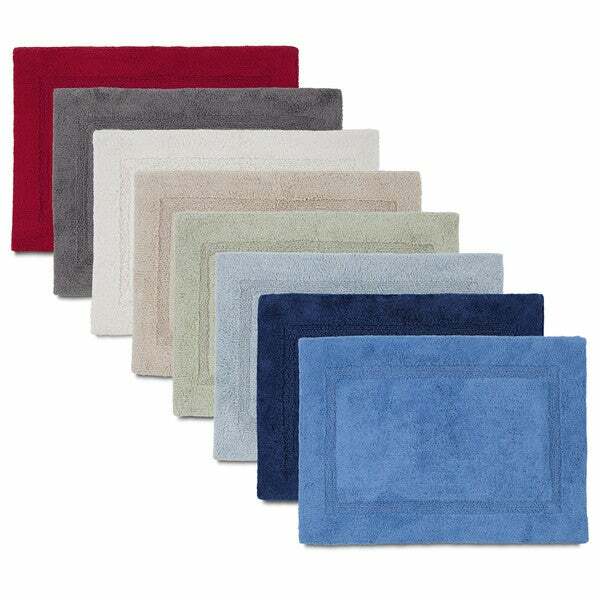 Rich color and appears it will be easy to wash. I’d recommend this highly and when buying another cotton bath rug, I would definitely purchase another. I really like these bathroom rugs. I purchased 2 in the color grey and it’s a perfect match with my decor. I recommend these rugs. They come in a variety of colors. I purchased this rug to place on the floor where my feet come into contact with it as I sit on the side of the bed. It's the perfect size for that. It's made of a nice soft cotton loop and the coating on the back keeps it from sliding around. When I received the rug I didn't think it would be as good at not sliding around as it is. The non-slip coating is almost invisible. If I had ordered this for my bathroom, I would have gone with a larger size. All in all a good little rug. Happy with the purchase. Looks good, nice and soft. The latex non-skid backing is not as sticky as rubber backings are, but it does stay in place fine on my hardwood floors. Just don't expect the same iron grip you get with rubber. I didn't buy a rubber backed rug because I like to put my rug in the washer & dryer and that eventually causes the rubber to disintegrate and make a giant mess of my washer/dryer. I'm going to use a delicate wash/dry on this and hope the latex doesn't do the same. At the very least it won't make a huge mess because the amount of latex is minimal. I like this bath rug very much. The back is no-slip, which works really well. The red color is deep and a good match for my towels. I would definitely recommend this to anyone. This rug is soft yet thick. I bought this for my granddaughters bedroom. She is getting the big girl bedroom for Christmas and is potty trained. Still use pull ups at night but I got this rug to use for under her potty chair in her room, its the mineral color and goes great with the theme in her room. Would def recommend for anyone in this category or for the bathroom. I was hoping to find a double sided rug in the color I needed, but these rugs are ok. Have a slight latex backing. i wish they were available in a larger size. It took me 3 tries to get the correct color delivered, as they were calling periwinkle "Mineral", so be aware. i received two French blue instead of Periwinkle the first 2 times. Customer service was accommodating and we finally got things squared away. disappointed in the confusion, however. Poor quality, slides all over floor and very low pile. Wouldn't order again. The worst quality towel for the highest price I will never buy there again. I got the navy blue in this product. The color isn’t quite right for me so I will be returning them. The quality seemed OK for the price and the size was perfect. Hate it the color is not going to work out. Love the color.Very well made. It’s not the product it’s the service. My first and last time I’ll order from this site. I did order this rug in mineral and twice you sent me a Martex rug in mineral. Never again. I was disappointed in these rugs. Couldn’t make up my mind about the color & purchased white. They catch everything! Because they are white. I love these little rugs. They were the perfect fit for my bath/shower area. I bought the beige. I have washed them once and they held their shape. "What color is the bright blue? Saw comments that suggest the pictures aren’t labeled correctly and wanted to verify before ordering." I ordered Navy true to color. Paired with Nautical Blue Striped Shower curtain. Looks great together!! The "bright blue" turned out to be the mineral color (blue hue). Although I was disappointed I liked to color and the material so I kept it. The color I got was called Glacier, which is not longer listed. It is, however, under HydroSoft Reversible Cotton Bath Rug (right column). The color shown looks pretty close to what I got. "Love the red in picture. Would like more infor. Also the red is not mentioned as a color. Could you be notify me about this. Thank you"
The red must be out of stock because I purchased one (should have gotten 2) in November for my bathroom to add red to my "holiday/poinsetta" bathroom. I like the rug and when the red comes back in stock, I'll probably buy another one. "The color "white"- is it true white or is it off=white? Then there is the "cream" color- is it more of a light beige? Id the color verging toward the pink tones, or the yellow shades? The color photos can be misleading." The white rug is a true optical white. The cream rug is a light beige, it does not have any pink or yellow tones to it.